The Centre comprises 22,675 sq ft letting area in 97 units which include Clavin Klein, Ted Baker, Snow & Rock, Clarks, Kurt Geiger, Gap, Levi's, French Connection, Tommy Hilfiger, Lacoste, Timberland, Ernest Jones, Next, Fossil, Vans, Marks & Spencer, Addidas and a 9 screen Odeon Cinema and food court. Adjacent to a 75,000 sq ft Sainsburys. The centre is situated opposite Sarn Park Service Area approximately 2 miles north of Bridgend town centre. 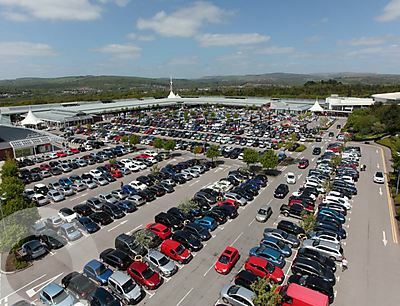 It occupies an ideal location midway between Cardiff and Swansea at Junction 36 of the M4 motorway.